It’s my great honor to kick off my book reviewing features with a thoughtful analysis of the most frequently challenged book of 2012 (according to the just-released list of 2012’s challenged books by the American Library Association). Ladies and Gentlemen I give you…CAPTAIN UNDERPANTS! The Captain Underpants series tells the stories of George and Harold, two boys who (sort-of accidentally) have caused their principal to turn into the super hero “Captain Underpants” whenever anyone snaps their fingers in his presence. Their adventures are endlessly convoluted and hilarious and yes, pretty gross. I’ve been a huge fan of the series ever since my daughter got her first Captain Underpants as a prize from the library, and for the first time, but not the last, got in trouble for secretly trying to stay up all night to read. It was a proud moment at our house, I tell you. This website will generally focus on books that involve some mix of science fiction, fantasy, or other geeky goodness, and romance. Just to be clear, there’s no romance in Captain Underpants. Captain Underpants and the Perilous Plot of Professor Poopypants promises romance on the cover but immediately adds (“Just Kidding”). There sure is a lot of geeky goodness, though. The most recent installment, Captain Underpants and the Revolting Revenge of the Radioactive Robo-boxers included the following elements: time travel, a pet pterodactyl, a robotic hamster, an explanation for the extinction of dinosaurs, the Big Bang, and the Ice Age, clones, and a giant squid. Top that. 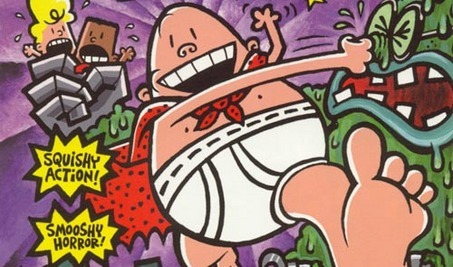 Captain Underpants is justly famous for its potty humor, but it’s a very clever series. It contains all kinds of wacky fun and some surprisingly sharp satire, as when Mr. Krupp spends some time in prison and discovers that it is remarkably similar to elementary school but with a bigger budget (Captain Underpants and the Terrifying Return of Tippy Tinkletrousers). George and Harold make fun of adults, but they make sure that no one gets hurt, and one of the messages of the books is that teasing people can make them evil – so don’t. “And where did that super evil rapidly growing dandelion come from?” asked Captain Underpants. George and Harold gasped. They looked at each other with the sudden panicked realization that only children who have created a giant mutated garden nuisance would know. Here’s what gets me: the reasons listed for challenging the Underpants series are: “Offensive language, unsuited for age group”. I hope I’ve made it clear that the Underpants series is more than poop jokes. But seriously, this is a series in which an entire book revolves around people being eaten by talking toilets (The Attack of the Talking Toilets, natch). What audience would anyone think this series is appropriate for? Here’s a tip – kids love potty humor. Adults (usually, OK, sometimes) don’t. When I think of a target audience for a book about wedgies, I don’t think “CEO of a major corporation”, although that would explain a lot about the state of finances today. No, I think: “Ages 5 – 10”. I did ask my handy nine-year-old consultant if she thought these books encourage her to disobey and disrespect adults and she said, and I quote, “They encourage me to disobey adults that are evil and crazy”. Sounds fair to me. Dav Pilkey is no stranger to the most frequently challenged books list. However, to the best of my knowledge, this is the first year that he’s made the top of the list. Congratulations Dav! You’re number one! You have joined the ranks of some amazing books, including To Kill a Mockingbird, The Color Purple, and The Lord of the Rings. May your underpants always remain soft and cottony and free from the evils of starch. Thanks for turning my kid into a reader! This entry was posted in Book Reviews and tagged American Library Association, Banned, Captain Underpans, Challenged Books, Children's Books, Dav Pilkey, gaming, Library, videogames.